Now that Claire Vaye Watkins’s second book, Gold Fame Citrus is almost upon us, it’s a great time to revisit her first book, Battleborn, a collection of short stories. Though these stories stand apart, they’re linked by place, in this case Nevada, which is so incredibly well depicted, by the end of the collection it forms an almost cohesive whole. Battleborn also contains ‘Ghosts, Cowboys’ one of the greatest short stories I’ve ever read, which jumps between historical fact, the narrator’s ending relationship, her mother’s illness (from watching nuclear tests in the desert) and her father, living in an abandoned movie set on a ranch with Charles Manson and a group of followers. As an opener it’s an almost perfect introduction to the book, which shows us how the mistakes of the past have a way of weaving their way through our lives. Highly recommended. 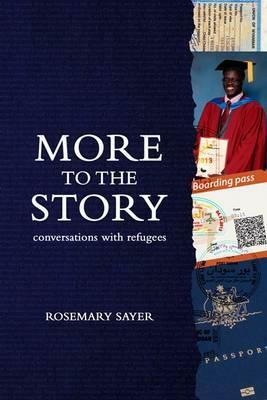 Rosemary Sayer’s collection of interviews with refugees in More to the Story goes behind the blinding haze of rhetoric and manipulated, selective statistics to reveal real stories of how people become refugees at the mercy of the international community. Sayer shares the accounts of displaced people without embellishment – there is no need to exaggerate the horror, heartbreak and sheer arbitrariness of birth or circumstance that precipitates the need for a person to flee their original home, the manifold traumas that often follow, and the complexities of relief and new hope if safety is attained. This is a deeply affecting and timely book and, while its stories are not tied together by food, it will appeal to anyone who enjoyed Recipes & Refuge. At a time like this when every day seems to reveal a despicable new violation of the most basic of human rights, it is heartening that there are writers like Rosemary Sayer and Chris Nguyen, and publishers such as Margaret River Press and Rag & Bone Man Press, who undertake projects like these not only because the stories are compelling and should be told, but because they care about the ethical health of our country and the plight of people who have simply found themselves in the wrong place at the wrong time, as any of us could. I’m reading an early copy of Helen Ellis’s story collection, American Housewife, and talk about pithy and ascetic gems! Ellis’s depiction of women is outrageous leaving me both fascinated and mortified in equal measure. If you are a reader with a dark sense of humour then look out for this collection as I can assure you that you are in for a wonderful feminist ride through the private homes of America. And terrific news just in… Ellis is coming to Melbourne in February, 2016. Melbourne sisters, grab your kitchen tools – a whisk, a knife, a gulp of sherry – and prepare to meet a writer that is on your side. There are few things I like better than a superhero with a terrible superpower, be it boring, useless or just plain ridiculous. So, cartoonist and graphic designer Jon Morris’s anthology of ‘regrettable superheroes’ is right up my alley. Morris has been writing about these kind of strange and unusual superheroes, many of which have been forgotten over time, on his blog since the 90s and his love for them is immediately apparent evident. As he writes in the book’s introduction: “To count these heroes out and consign them to oblivion without appreciating what they represent – evolving notions of heroism, insights into comic history, and a sampling of fantastic fashion trends in cape-and-cowl ensembles – well, that would be truly regrettable.” It’s true that The League of Regrettable Superheroes is a book for comics fans, but I also think it has the power to win new fans, especially those who think that the glamourised superheroes of blockbuster films are all there is to this endlessly imaginative and exciting genre.